So I am at a graduate school of education, home of teaching people how to give urban kids a crappy education. I am currently using all my powers to ward off the incessant doctrinal attacks on being oldschool. An argument I had with my instructor yesterday should serve as an excellent starting point. The class is a “methods class” on teaching social studies. We were practicing writing a lesson plan, as a class. The lesson was about Hurricane Katrina and its effects on New Orleans. So we dutifully planned the lesson, and then came to the part about what homework we were going to assign. After deliberation, the class decided that, as homework, our high school students would have to design a Hurricane Survival Kit. I meekly raised my hand and said, “well, this is a very creative lesson, but I think maybe it’s a little too lite, especially the homework.” My instructor replied, “well, actually, I think it’s quite difficult. They have to use all this information from class and synthesize it and even maybe look up an evacuation plan for their city.” Right. Here would be the Hurricane Survival Kit from most of the kids: , where the blank space represents how they didn’t do the assignment because it was stupid. Instructor (who is, sadly, very smart): Well, does reading 20 pages a night give you all the skills you need? Me: Well, it sure does improve your reading. Instructor: But what about life skills that are so important today? Me: Those are great too, but there’s not really a lot of time for that, what with needing to read. Me: But basically, reading and writing [we don’t talk about math] skills are really what you are going to need in college. They are the limiting factor here. Even if you have the other skills, if you don’t have reading and writing, you’re just not going to college. Instructor: Well not everyone wants to go to college. At that point, I sat back in my chair, crossed my arms, and looked resigned. Let me paraphrase the underlying thinking here. Basically, we must produce project-based edu-tainment to occupy the kids who couldn’t care less about school, meanwhile dooming the other kids (and there are more than you would think) to failure in ever attaining any kind of dreams of accomplishment. She argued that traditional education is a turn-off to urban kids and that trying to force them to do it will cause them to drop out of school. Hello. They already are, in huge droves. The schools that do what I’m talking about–the oldschools–are actually successful. I don’t think it’s easy to work with urban kids–they have a lot of really difficult things to deal with at a young age. But some of them can make it, IF we let them. After class, in an email, she suggested we start a message board discussion of these ideas so they won’t take up so much class time. Excellent. What do future math teachers learn in ed school? This paper aims to discuss epistemological and philosophical foundation of meaningful learning and teaching mathematics and science from the perspective of radical and social constructivism. I have reflected on my experiences of radical and social constructivism through dilemma, dialogue, and defense of my personal epistemology of learning. I went through articles of different authors which immensely put me into a dilemma as I tried to make connections to my experiences of learning and teaching mathematics and science. While doing this, I found myself in a great crevice of philosophical tensions between radical and social constructivism that lead into further dialogue between two selves, one as radical and other as social constructivist, and defended each epistemological/philosophical identities in terms of learning and teaching mathematics and science. Teachers can facilitate a student’s self imposed learning by using techniques like; peer to peer learning which is when students are left to their own means of discovering the answers to their exercises. After a lesson is introduced students can attempt to learn together and try to help one another solve the problems. Another useful tool for community learning in the classroom is reading or literacy circles. Students are given guidelines and challenged to find the answers as a group. Working together takes the pressure off of an individual and encourages shared learning. The teacher’s job is to introduce concepts, ask questions about the subject and show them what route to take but the students get to the answers by themselves. Recent studies conclude that teachers are important for student learning but it remains uncertain what actually determines effective teaching. This study directly peers into the black box of educational production by investigating the relationship between lecture style teaching and student achievement. Based on matched student-teacher data for the US, the estimation strategy exploits between-subject variation to control for unobserved student traits. Results indicate that traditional lecture style teaching is associated with significantly higher student achievement. No support for detrimental effects of lecture style teaching can be found even when evaluating possible selection biases due to unobservable teacher characteristics. You can find scattered studies showing success with student-centered learning in some settings. You can find many studies showing success with teacher-centered learning. What you absolutely cannot find is a large and respected body of scientific research establishing constructivism as superior to direct instruction. Yet education schools teach student-centered methods as dogma. New ‘theories’ of education are introduced into schools every day (without labeling them as experiments) on the basis otheir philosophical or common-sense plausibility but without genuine empirical support. Simon’s observation appeared in a paper published in 2000: “Applications and Misapplications of Cognitive Psychology to Mathematics Education” by John R. Anderson, Lynne M. Reder, & Herbert A. Simon | Texas Education Review, v1 n2 p29-49 Sum 2000. As E.D. Hirsch tells us, the thoughtworld of education schools has insulated them from science — and, today, from common sense as well. Why do educationists want to flip classrooms? This graphic from Knewton, which writer David Neilsen links to, explains the rationale behind ‘flipping’ the classroom. The goal isn’t to “engage” students (Powerpoint movies are boring) or to increase achievement (achievement won’t be measured), but to eliminate the teacher as “sage on the stage.” Or, because the teacher-sage can’t be eliminated altogether–not if you want students to pass Regents examinations–to banish the act of explicit instruction out of sight, in the student’s home. Explicit instruction is rejected by education schools. In their ed-school classes, aspiring teachers and administrators are told that students must teach themselves via “inquiry,” “discovery,” “problem-solving,” “collaboration,” and the occasional “struggle.” The correct role for the teacher, they learn, is as “guide on the side,” not “sage on the stage.” Guide-on-the-sidery is the core belief, the core message, and the core teaching of the education programs all public-school teachers and administrators are required to attend. It is also the core teaching of the “professional development” provided by education schools and their graduates. In all likelihood this group of teachers singing about becoming guides on the side thanks to Common Core wrote their song at a professional development workshop. The dream of the flipped classroom is the dream of finally removing the teacher from the front of the classroom forever. UPDATE: Mathematics teacher Vern Williams responds: One of our local high schools started the flipped classroom strategy and both students and parents pretty much rebelled. I was asked to tutor former students taking Algebra 2 who had been outstanding “real” Algebra 1 students. I actually encourage my students to hang out on Khan’s site but only because many of his lessons are interesting and can serve as an excellent supplement. An important part of teaching and learning math is the interaction among students with their peers and teacher WHILE learning is occurring, not a day after the fact. And that even assumes that quality learning occurred while watching videos with no opportunity for questions. The guide on the side folks have been trying to separate me from my students for the past forty years. They accuse you of being the sage on the stage because you dare attempt to teach. 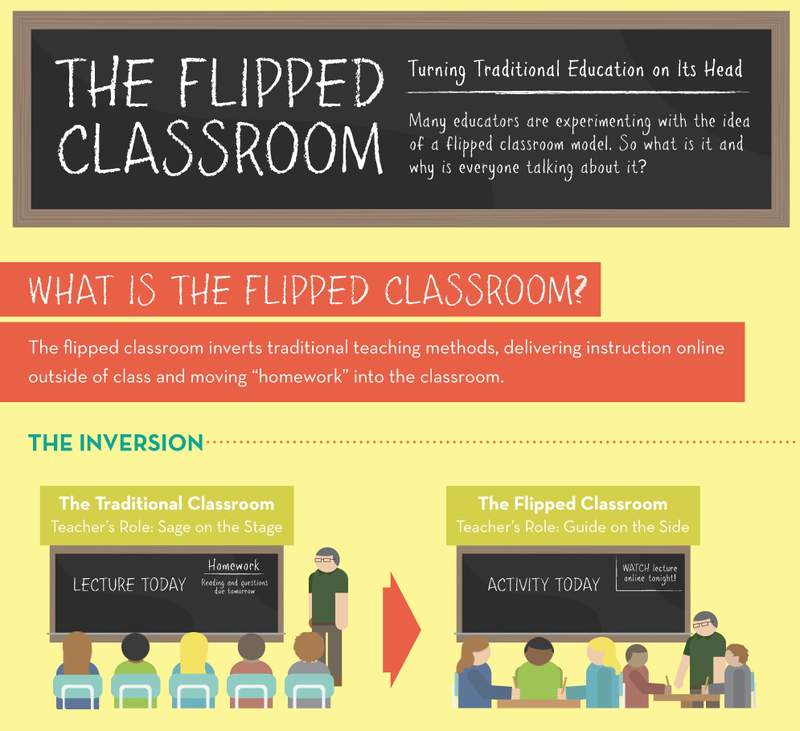 If flipped classrooms are being pushed by educrats and colleges of education, beware.